A five-year-old State Department effort to upgrade Afghanistan’s largest prison has been halted with only half the contracted work performed, a watchdog found. 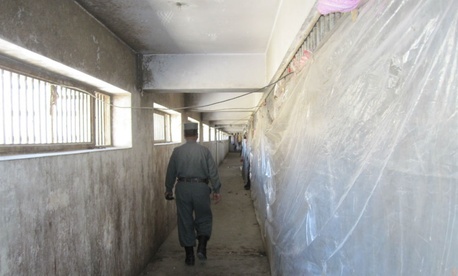 The Pol-i-Charkhi facility in Kabul Province -- designed in the early 1970s for 5,000 prisoners -- currently holds 7,400, according to a report by the Special Inspector General for Afghanistan Reconstruction. And though overcrowding has forced prisoners out into the halls, it appears to be well maintained, SIGAR determined, despite some “defective workmanship” performed under the $20.2 million contract with the Al-Watan Construction Co. The contractor “substituted wood for metal roof trusses without authorization and covered 30-year old wood trusses with new roofing material, rather than replacing them as required under the contract,” SIGAR determined in a probe from April to September. The renovation work was overseen by a contracting officer’s representative—a State employee—who was later convicted in the United States of improperly accepting gratuities from a bureau of narcotics contractor. Three related projects that State funded at a cost of $5.3 million -- a potable water tower, a commercial power upgrade, and a new staff barracks -- were completed successfully, the IG reported. SIGAR recommended that Kerry direct the bureau to determine the extent of the use of lesser-quality building materials, monitor future renovation costs, re-think the prison’s wastewater management needs and investigate how the contracting officer arrived at the final payment amounts to the terminated contractor before the contract was fulfilled. State agreed with all recommendations except the one on probing the contractor, arguing that its own inspector general investigated the incident and applied discipline in 2010, when the contract was halted.